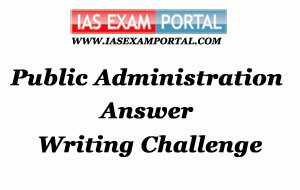 Weekly Mains Exam 2016 Answer Writing Challenge - Public Administration "MODULE- 47" | IAS EXAM PORTAL - India's Largest Community for UPSC Exam Aspirants. Weekly Mains Exam 2016 Answer Writing Challenge - Public Administration "MODULE- 47"
Public Administration- Paper I "Syllabus Topic – Personnel Administration: pay and service conditions"
Q1. "What are the principal considerations in developing a sound remuneration for civil servants ?" The remuneration or the pay constitutes the most important single factor among the attractions of public service as it is not only a source to support the personal responsibilities of a personnel but also it is significant with the respect to the prestige that it commands in the estimation of the publicThere are several considerations while developing the remuneration for civil servants. (e) to compensate for the rigours of the field service. Indian Administration- Paper II "Syllabus Topic –Financial Management: Parliamentary control of public expenditure"
Q2. Discuss the major approaches/theories to understand the growth of public expenditure.